Carol Valentine died this month at the age of 98. In characteristic fashion, she did not want a funeral or any fuss made over her passing. Our paths first crossed in 1970, when she became interested in the downtown community organic garden located at the corner of Figueroa and Chapala streets. It was the very first project of the Community Environmental Council (CEC). When I last saw Carol about six months ago, she told me she was fascinated and amused by the audaciousness of young people planting an organic garden on an empty lot in the heart of town. That initial connection led her to make an audacious decision of her own, to encourage the CEC to create an urban farm, one of the earliest urban sustainability efforts in our community, on the 4.6-acre property that is now Alice Keck Park Memorial Gardens. The site was owned by the Santa Barbara Museum of Art. 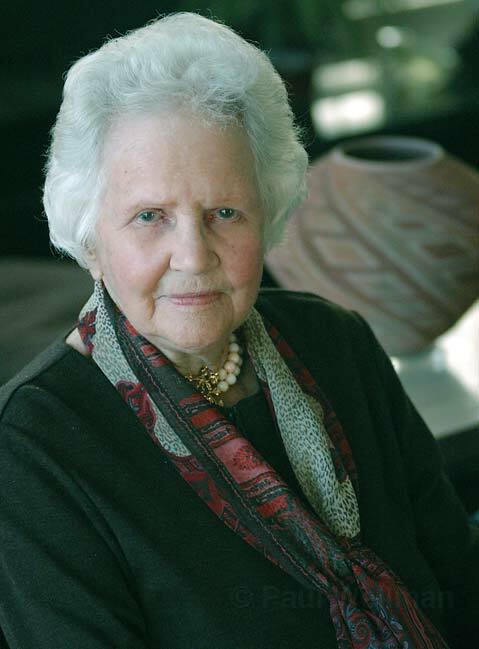 Carol was a museum trustee and a prominent philanthropist. The museum planned to build a new facility on this property, which was weed-filled and littered with old foundations from the razed El Mirasol Hotel. She invited me and two of my friends who were graduate students at UCSB to make the case for why the museum should allow the CEC to use the property until they were ready to build. This was in early 1972, when UCSB students were viewed more as rabble than a community resource. That Carol would put herself out there to let a group of university students experiment with and teach organic gardening, composting, and solar energy earned my eternal gratitude. Classy is the way I would characterize Carol. She was classy in heaps-in dress, in manner, in her artistic tastes, her eye for horticulture, and her sense of grace. Everything seemed to come easily and naturally to her. But she told me one day this wasn’t always so. When she came to Santa Barbara from the East Coast in the mid 1950s, a single mother with two children, she said she lacked self-confidence and had little experience in civic affairs. But here she experienced a transformation, becoming the chair of the museum’s Board of Trustees and the Montecito Water District and a much sought after patron of the arts. She learned that she had a gift for organization. She could make things happen. Horticulture was one of Carol’s great interests. Perhaps her finest horticultural accomplishment was the organic vegetable and herb garden that Santa Barbara’s famed landscape architect Isabelle Greene designed in collaboration with her. It was always a thrill to visit her at her home and take a walk in that glorious garden. Carol’s classiness was magnified by a luminous intelligence. She was clear, precise, and in command of her life, yet always self-effacing and understated. And she was great fun to be around with her child-like curiosity and wicked wit. Now out of her mortal coil, she leaves a remarkable legacy. Carol was largely responsible for making Lotusland, created by the late Ganna Walska, the public prize that it is. As its founding trustee and chair, Carol shepherded the project through a minefield of doubting neighbors and a labyrinth of permit conditions. We can thank Carol Valentine for making this garden another Santa Barbara treasure. And about 350 miles away, in the eastern Sierra, at the edge of the town of Mammoth Lakes, Carol created yet another treasure, the Valentine Reserve. This family compound built by her late husband, and its surrounding 50 acres of unspoiled primeval forest and riparian areas, she bequeathed to the University of California and its Reserve System. Managed by UCSB, the Valentine Reserve is now an important research site for scientists and students. So you see, Carol Valentine-a valentine indeed-may not have wanted any of us to make a fuss over her life. But a life this large deserves to have a big fuss made over it.